Networking with more than 700 nutrition education peers and colleagues from around the world. 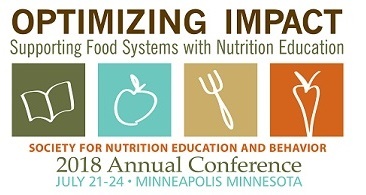 More than 40 sessions on nutrition education research, programs, and practice covering topics including families, technology, food service, weight and health across the lifespan, communications, and more. Poster and oral abstracts presentations covering groundbreaking research and programs happening in the field. New in 2018: SNEB is launching a mobile app for the 51st Annual Conference! Stay on the lookout for details on how to download the mobile app once it becomes available. And more! Complete conference details including speaker list, hotel room rates, and more, can be found at www.sneb.org/2018. For questions or more information, email info@sneb.org. Cast your vote by 11:59 p.m. Eastern tonight, March 15. Each link is personalized and each member can only cast one ballot. If you have not received an email to complete the ballot, email kjenkins@sneb.org to request a personalized link. The SNEB Public Health Nutrition Division awards were created to recognize the excellence of our members' contributions to public health nutrition, four awards will be made by the division. Two awards will be made for contributions to Public Health Nutrition research by outstanding student researchers, and two awards for outstanding Public Health Nutrition practitioners/ researchers. Awards are available only to SNEB Public Health Nutrition Division members. Members may nominate themselves or other division members. All applications must be received no later than April 1, 2018. Overweight and obesity remain one of the nation's most serious health problems, putting more than two thirds of US adults at heightened risk for a range of chronic diseases. Although overweight/obesity affects people in the US of all socioeconomic statuses, genders, races, and ethnicities, low-income and minority groups are disproportionately affected. Under the Healthy, Hunger-Free Kids Act of 2010, the Supplemental Nutrition Assistance Program-Education (SNAP-Ed) was reestablished as the Nutrition Education and Obesity Prevention Grant Program. For the first time in the program's history, weight management falls within its scope. To inform the development of new SNAP-Ed curricula to address obesity prevention, researchers at the University of Georgia conducted a needs assessment to examine the associations among self-reported weight status, weight perception, and weight management practices of SNAP-Ed participants in Georgia. Define the goal of the Supplemental Nutrition Assistance Program-Education (SNAP-Ed). Compare the prevalence of overweight and obesity among the study sample of SNAP-Ed participants in Georgia to state and national statistics. Describe the correlation between accuracy of weight perception and weight management practices reported in the literature and observed in the study sample of SNAP-Ed participants in Georgia. Be sure to read insights by these authors who are also members of SNEB. Download the USDA Food & Nutrition Service Food Buying Guide mobile app on Android!